Following on from my previous post on the network journalist role, and as part of a wider experiment around the 5 roles in an investigations team, I wanted to flesh out what exactly a community editor role means when adopted as part of a journalism project. First I need to add a disclaimer: the terms “community editor” (CE) and “community manager” (CM) are used to refer to a very wide range of jobs in a number of industries. I’m not sure what distinction there is – if any – but my hunch is that the title ‘community editor’ has been overtaken by its ‘manager’ variation because it rightly places the focus more on the community than its content. The CM’s website(s) already have active communities. The CM’s role is to maintain, support, and further develop those. This post will be dealing with the last situation, which is the one in which most journalists first find themselves: with neither a platform nor a community. This seems like a no-brainer but it’s all too easy to miss communities because you can’t find any evidence of them on Twitter or Facebook. Along with specialist social networks (LinkedIn for professionals; MySpace for musicians; even profession-specific networks such as Doctors.net), there are forums, wikis, mailing lists, and various other places where people gather to share information and support. Look for the communities in every corner of the net – don’t expect them to come pre-labelled. For example, the forums of local football clubs and local newspapers often contain corners devoted to topics other than football and news. And follow people as well as topics: if you find someone in your field, search for their username across the web and see what other places they contribute to. One other place to look: the physical world. Live events, conferences, meetups and other gatherings are ideal places to build relationships with members of the community – as well as a great opportunity for providing live coverage online that will lead you to others, and others to you. Once you’ve identified and are following the community, try to find your best role within it. Remember that the community is not here to serve you: barging in and asking for case studies will get you the same response as if you did that in any physical social space: blank stares and muttered insults. The simplest way to find a place in a community is through solving problems. Listen for questions that people are asking, or complaints that they make. A key skill of a journalist is to find the answers to questions, or get responses to complaints – so that’s likely to be one way you can contribute. Those answers and responses, of course, also make for good evergreen content (which can help you attract other members of the community), so cross-post them on your blog as well as on the platforms where the community gathers. You might also see the need for physical meetups or other events – don’t be afraid to get stuck in and organise one. You will be both a better journalist and community editor if you listen as much as possible, and ask when you want to hear more about something. It doesn’t have to be newsworthy – in fact, it’s sometimes better when it’s not – because often it’s an understanding of the small details and complex context which makes for better journalism and, by extension, better – and more – relationships with contacts. As you explore a community a good practice to adopt is to record your research in ways that make it easier for others to engage with the community too. 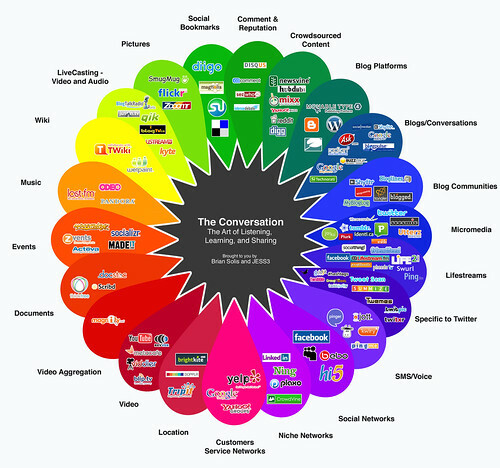 This helps you see what is interesting about a community, as well as creating content which can help contacts find you. You may need to make a choice on where to post this content, especially if the community is not a big user of blogs. Don’t publish in a way that is disconnected from the community that you are supposed to be serving: at the very least cross-publish to the platforms where discussion is healthiest. Don’t spam shared spaces with links to external content. You might also profile members of the community, or – at a later stage – create something that pulls together profiles, points of view, or experiences. For example: this Times Educational Supplement piece collects excluded pupils’ experiences (incomplete version online); We Are The 99 Percent uses Tumblr to pull together the experiences that inspired a protest movement; and Spitalfields Life seeks to document the places and people of the area, while this Guardian interactive allows you to explore the voices of 100 NHS workers on health reforms. Finally, it’s important to link to content from your community as often as possible. This does two things: firstly, it demonstrates good attribution and demonstrates that you are not looking to take credit for yourself which belongs to others. And secondly, it makes other people aware of your work: a link to another blog generates a ‘pingback’ which alerts the author to your piece. Twitter users are notified if their tweet is retweeted by you, Facebook users if you ‘like’ their update, and so on. Comments are an extension of the same principle of acknowledgement. Linking – or ‘linkblogging’ – is also the simplest way to begin engaging with a field and its communities, and a good habit to get into if you want to understand an area and get in the habit of keeping up to date with it. For more on that, 7 ways to follow a field… is a good guide. As you gain in confidence and reputation, you may find yourself doing more and more in your community. Community management is, to my mind, one of the hardest roles in online journalism to do well, and the more insights you can gather from others, the better prepared you will be. This list of resources from FeverBee is as good as they come. You should also follow blogs in the field – that list contains a section on those, but if you just want 5 to start with, here’s a bundle to subscribe to. PS: If you want to see explanations of job descriptions of the CM, and other roles such as social media manager, this post by Blaise Grimes-Viort does a very good job of trying to unpick the subtle differences and links to typical job descriptions. More on traits of community managers at ReadWriteWeb, The Constant Observer and Business2Community. This entry was posted in online journalism and tagged brian solis, community management, hi5, Mixi, orkut, social media prism on March 27, 2012 by Paul Bradshaw. This entry was posted in blogging and tagged brian solis, community management, hi5, Mixi, orkut, social media prism on March 27, 2012 by Paul Bradshaw.